As science and technology evolve, innovators in various industries find ways to apply those advances within their spheres of influence. Professionals in foodservice are no exception, using developments within chemistry, technology, and medicine to improve the food and service offered. Below, we take a look at some of the historical innovations that contributed to what is now considered commonplace in restaurants and preview new developments showing up in restaurants around the world. 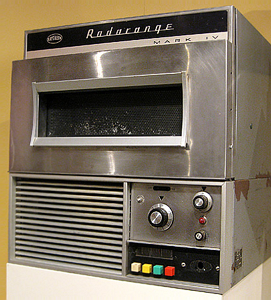 Early 1960s Raytheon microwave. Image courtesy of Johnson & Wales University. You may be surprised to find how much World War II influenced the development of restaurant equipment, as well as residential kitchen technology still used in most American homes. 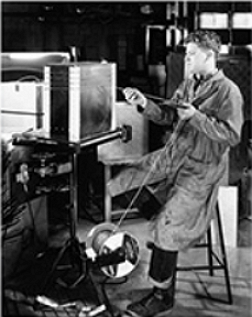 In 1945, while working on magnetron designs for radar equipment to help detect German submarines, Percy Spencer accidentally melted a candy bar in his pocket. Immediately after, he popped popcorn, beginning a microwave tradition that continues to this day. It took a little while for the technology to be perfected, as there is quite a difference between radar and cooking, but large commercial microwave units were available first, and by 1967 countertop microwave ovens were available for residential use. Another piece of commercial equipment influenced by the war is the cotton candy machine. While the original machine was invented in the early 1900s by a dentist and a candymaker, when the machines first started being sold commercially they were made with surplus motors from World War II. 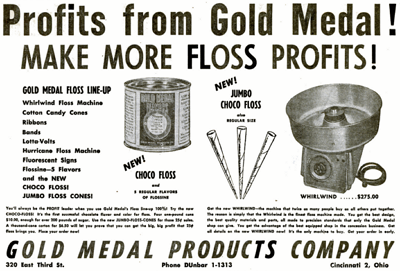 Eventually the designs were changed to call for new, specially designed drive systems, but those initial surplus units allowed companies like Gold Medal to get their cotton candy machines on the market, creating demand for the fluffy treat that is still popular today. Another industry that has had an influence on foodservice is professional sports. A football field warming system meant to prevent freezing during 1967’s infamous Ice Bowl inspired restaurateur Jerry Maahs to create a holding cabinet with Halo Heat using thermal heating cables. This technology eventually led to the creation of cook and hold ovens, which help many restaurants save on labor by allowing them to cook food well ahead of time and keep it hot without overcooking. Applying ideas from other industries to the restaurant business isn’t just a thing of the past. As organic, local sourcing has become a focus of customers, more restaurants have added gardens to their properties, allowing them to grow their own herbs and produce. 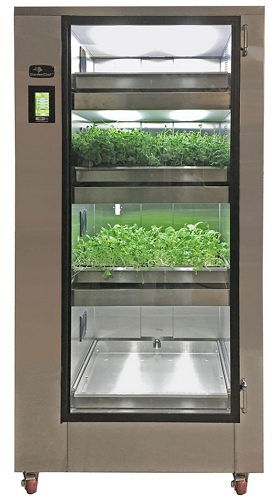 Because not every restaurant has the space to do this, Carter-Hoffmann took some inspiration from indoor gardeners and introduced the GardenChef, a grow cabinet that enables chefs to grow herbs and microgreens directly in their kitchens. 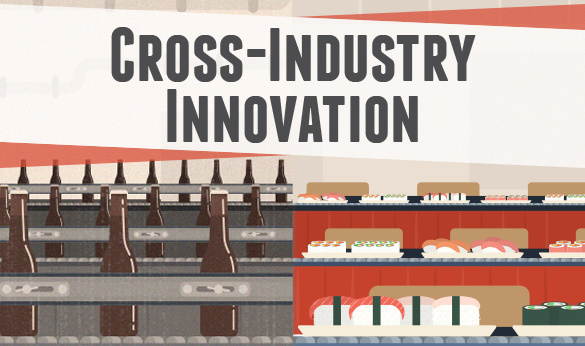 Equipment isn’t the only part of foodservice that has been influenced by other industries. Service and customer interactions have also moved forward with a little inspiration from other sectors. One example of this is Kaiten-zushi restaurant, a concept that originated in Japan but is gaining popularity around the world. Kaiten-zushi translates to “rotation sushi,” a name that describes the process aptly. In these restaurants, chefs place plates of sushi on a conveyor belt, which winds around a bar in front of customers, and in some cases travels around the wall of the restaurant as well. Customers simply take the sushi they want, then pay at the end of the meal. The inventor of this concept, Yoshiaki Shiraishi, was inspired after seeing the conveyor belt design used by a brewery to move beer bottles. Technology is being increasingly integrated into restaurants, with touchscreens appearing on tabletops and in drive-through locations. Some restaurants that use self-order kiosks are now also starting to use facial recognition as an optional tool for accessing order history. Facial recognition technology was originally developed for the U.S. government, presumably for the intelligence community, but it is now widely available commercially. Another great example of technology being used to improve the customer experience is RFID, or radio-frequency identification. RFID was first created to be used by the transportation industry as a way of automating highway toll systems, but quickly found its way into other applications. RFID is used for product tracking, restricting access to those with badges, and finding lost pets. The restaurant industry is making use of RFID technology at fast casual restaurants, where customers order at a counter, then wait for food to be delivered at a table. In the past, these customers might have been given a number tag to display on their tables, leaving servers searching the whole restaurant. Now Table Tracker uses RFID to tell servers exactly where the diners are sitting, helping ensure food arrives to the table faster and fresher.